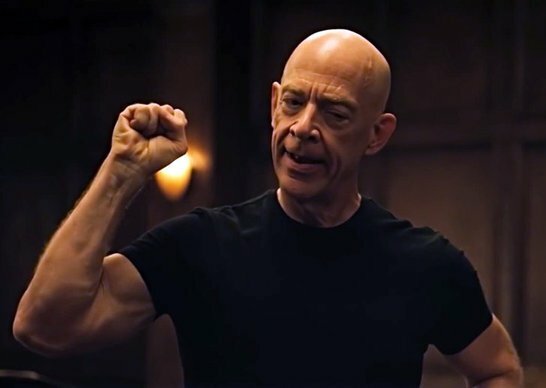 Do you remember your reaction when you first saw J.K. Simmons’ drastic body transformation? You know — that selfie taken inside a Golds Gym with Jonathan Kimble Simmons flexing his VERY VERY VERY NEW ‘guns’ while engaged in standing bicep curls. 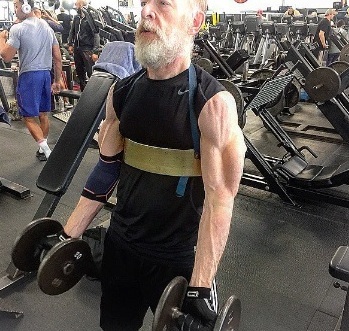 Like a flick of a light switch, J.K. Simmons made physical gains typically associated with Masters level bodybuilders. Contrary to successes solely gotten by weight training, the exceptional Simmons case has fueled speculation of a PED ‘chemical assist’. A potential stack of revolutionary steroids & hormones that promotes rapid red cell reproduction with a gain of disproportionate strength. The success of this type of endeavor is predicated upon procurement tactics that involve smuggling, inventory management, and secure client lists. Many profiles for steroid users exist; ranging from (1) active competitors in organized sports, and (2) entertainers seeking exposure in main-stream or alternate lifestyle content* to (3) ‘gym rats’ merely in search of seasonal physiques. 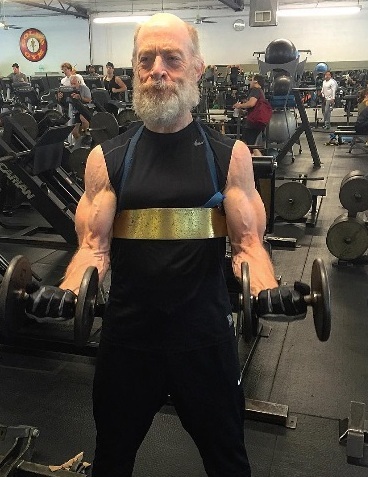 Does J.K. Simmons belong to that subset of Southern California and Nevada stars who quietly search out bodybuilders willing to offer their bundled services? If so, who’s the probable Candy Man? “Welcome to the gun show!” states Aaron Williams – personal trainer who prepped Simmons for his role as a (more muscular…) Commissioner Gordon in the upcoming “Justice League” movie. 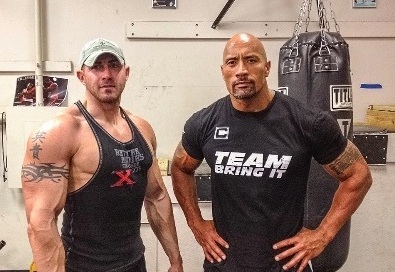 Aaron is an ex-Marine who’s trained other popular entertainers including Zac Efron, and Dwayne “The Rock” Johnson. On his instagram page, Aaron writes, “Every time we train together I forget he’s 61 years old. So much respect for this guy.” Certainly, Aaron Williams has been the proverbial “Go To” person for J.K. Simmons, Magic Johnson, and Zac Efron, Dwayne Johnson, and others who’re seeking a quick fix for their short-term objectives. Aaron is not alone. Estimates peg steroid and PED use among leading actors at 20% – 40% with potential explanations including (a) aging actors’ need to compete with younger actors for certain character types and (b) the growing production of action oriented films or productions with brutish and/or gratuitous visuals. For every category of user, there is a corresponding service provider. Oftentimes, 90s era bodybuilders are reliable partners to prospective steroid-driven clients. If you’ve viewed the www.steroidanalysis.com website in its entirety, you may recall imprisoned bodybuilder – Craig Titus who professed his steroid expertise as well as dealings with actors, professional athletes, and rock stars. Even actors may serve as suppliers to younger colleagues since these circles are highly protective and less prone to self-destruct. Did you know that Dwayne “The Rock” Johnson confessed his use of steroids to a reporter during an impromptu interview inside a New York City taxi? Afterward, Johnson co-stars in a few comedies; sporting a sleek & juice-free body before gearing up to revisit the worlds of wrestling and moviedom. The satiric wit of bloggers and TMZ have occassionally addressed the notion of ‘Actors on Roids’ like Dwayne and Zac Efron. Journalists have even related Zac’s outward metamorphosis to his increased gym exposure to Dwayne Johnson. They pointed to the development of the friendship between Dwayne and ‘jacked up’ Zac (as well as all the perks that comes with…) prior to the upcoming Baywatch movie remake. Tinsletown gossip can be unrelenting with others coming under scrutiny such as Henry Cavill’s Superman, Ben Affleck’s Batman, and Arnold Schwarzenegger’s offseason flab. From a practical standpoint, this highlight the need for law enforcement to finally confront those who engineer steroid supply conduits tailored outside of the ordinary athletic domain. Further analysis may be recommended to decompose this pharmaceutical framework by assessing physician scripts to consumers with illegitimate medical issues. Investigators may identify logistics and shipment details that are designed to evade law enforcement. Finally, there may be a need to imagine ways in which this esoteric infrastructure can be quickly modified to supply other items for other illicit purposes.